[PDF] Taming Your Gremlin: A Surprisingly Simple Method for Getting Out of Your Own Way | Free eBooks Download - EBOOKEE! Description: This is a completely updated edition of the 1983 classic that introduced a powerful method for gaining freedom from self-defeating behaviors and beliefs. 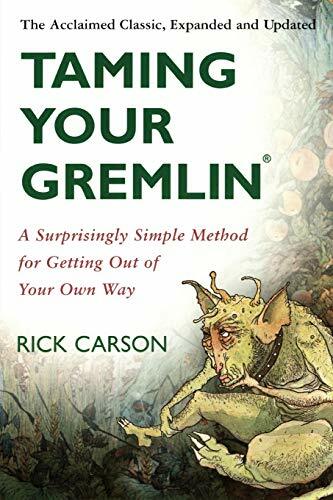 Rick Carson, creator of the renowned Gremlin-Tamingâ„¢ Method, has revised the book to include fresh interactive activities, real-life vignettes we can all identify with, and new loathsome gremlins ripe for taming. Carson blends his laid-back style, Taoist wisdom, the Zen Theory of Change, and sound psychology in an easy-to-understand, unique, and practical system for banishing the nemesis within. Among the things you will learn are: â€¢	Techniques for getting a sliver of light between the natural you and the monster of your mind. â€¢	The extraordinary power of simply noticing and playing with options. â€¢	Six keys to maintaining emotional balance amid upheaval. No comments for "[PDF] Taming Your Gremlin: A Surprisingly Simple Method for Getting Out of Your Own Way".